set in lovely gardens and 35 acres of wooded hillside. Consistently winning awards since 2009.
and Real & Local Food 2017. Hoteliers of the Year 2011. 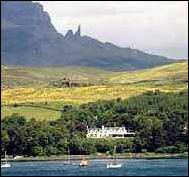 Situated in southern Skye. Skye Bridge 13 miles. Armadale to Mallaig ferry 8 miles. Day sailings available on the hotel's luxury yacht (April to September). Fishing and golf packages also available. Well stocked wine cellar and large selection of malt whiskies. Lighter meals available in 'The Chart Room'. Sky TV, telephone, hairdryer, hospitality tray, toiletries. Fridge minibar in all rooms except petite rooms. B&B prices from £104 per person. with its own 9-hole (18 tee) golf course. CIS Excellence Award - The Group Hotel of the Year Award 2018. Fine Dining Restaurant Hotel of the Year 2017 and Style Hotel of the Year 2017. Portree 6 miles. Dunvegan 16 miles. Fishing is available on the River Snizort. Restaurant serving local produce with an extensive wine list. Lounge bar well stocked with malt whiskies. B&B prices from £47.50 per person (based on 2 sharing). Winter specials (November - mid March). Open for Christmas / Hogmanay. 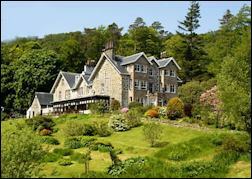 Multi award-winning, luxury contemporary Scottish country house hotel. Beautifully decorated and furnished. Personally run. Winner of Island Hotel of the Year 2005, 2007, 2013, 2014 and 2018.
and Romantic Hotel of the Year 2017. 5 minutes drive from Armadale (ferry from Mallaig). The Iona Restaurant has AA 2 red rosettes. Daily changing dinner menu. Fresh local produce. Small weddings and functions catered for. 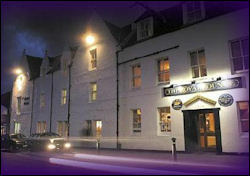 Scottish Tourist Board 4 Star Small Hotel. ensuite shower (some also have a bath). B&B prices from £109 per person. run by the same family for 25 years. 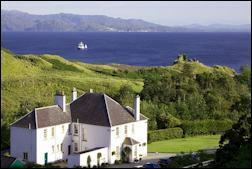 overlooking Portree Bay with views to the Cuillin mountains. 10 minutes walk from Portree town centre. Scotland the Best, Stevenson's, Johansens. Stylish restaurant with views of the gardens, loch & mountains. Bar / conservatory serving lunches and light meals. Guest lounge with log fire. tea / coffee, hairdryer and telephone. 2 bars (one with live Scottish music in the evenings). 2 restaurants. Free WiFi access in the lounge. Guests have free access to the fitness centre (gym) on the first floor. 26 ensuite bedrooms all with TV. Disabled access bedroom with wheelchair accessible shower.